Carmarthenshire Fungi: A Waxcap find from Pembrey Country Park. A Waxcap find from Pembrey Country Park. Waxcaps generally have brightly coloured caps and might seem easy to name but I find these difficult. Some have a characteristic smell or taste, features not picked up by the camera. Some have either cap or stem viscid/moist while with others one or both are dry! Colours also change from young fb to old and colours can get washed out by rain. This attractive looking waxcap was found at the edge of a track in Pembrey Country Park on 3rd November. Nothing that matched these could be found in several general fungus books but there is a splendid monograph 'The Genus Hygrocybe' by the Danish mycolgist David Boertmann. 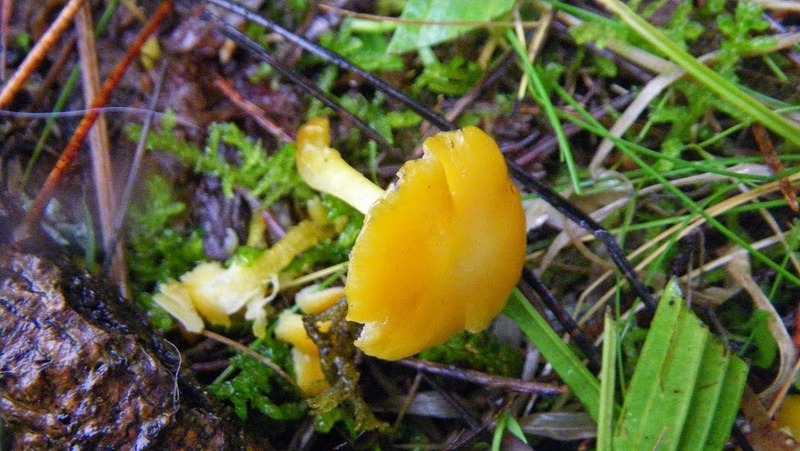 There are several species with a reddish/orange cap. The gills with this find are 'adnate to decurrent' and the spores, to my mind, fitted a species called Hygrocybe constrictispora. There are just half a dozen or so records for this species, three of which are from Ireland, two from England, one Scottish and Martyn Ainsworth at Kew says he collected this in 2006 from Whitford Burrows. Martyn, with others, is involved in a project sequencing (DNA) the waxcaps so a collection from Pembrey has gone and the answer will come in due-time. The lower two photos were taken a week after the others and show how rain seems to have washed out the red/orange colours. I think I must have come across the same group last week and taken the same photo! Wow. That's really exciting Philip. If both yourself and Colin saw the same patch, I'm assuming you can't be far off a well worn path in Pembrey. Is it easy to find? Just next to a main track so I covered the patch with a branch and bracken fronds to protect from meddlesome folk --- I then found these moved so knew someone else had spotted them!!! I told Martyn at Kew he might get another enquiry. Now so washed out they look like any old yellow waxcap. Tony Ivens just emailed having found something similar but again just yellow so ??? BMS/Kew are starting a 'Lost and Found' project for species not seen for years or rarely and Martyn thinks this could be one for the list. Interesting!